For the most dedicated surfer, winter is no obstacle. Though the impressive swells may have faded from the late Summer peak, St Ouen's still delivers some fantastic waves to catch this time of year, and many go out to enjoy the thrill, even on the bitterest of days. For those unlikely to embrace the wintery waters, the 5-mile strength of untouched beach is a beautiful location for long walks and family adventures, with the opportunity to trek further inland across the sand dunes and into neighbouring country lanes. The kind of trails perfect for a weekend outing to unwind and take in the view. Whatever you decide to do and whatever the weather decides to bring, the Watersplash is a great place to warm up and cool down from a day's activity at the beach. 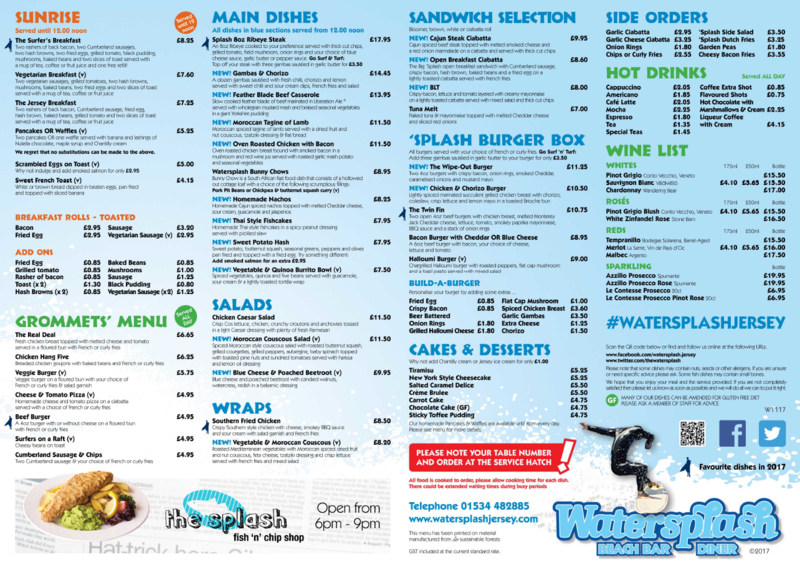 The all day diner at the Watersplash has a new winter menu filled with tasty treats to enjoy. You could try the Wipe-out Burger, living up to it's name by featuring two 4oz burger patties, crispy bacon & onion rings with a side of french or curly fries. Or go even bolder: as with all our burger box choices, there is option to 'Go Surf 'n' Turf' by adding three sauteed gambas! After a bracing walk or swim, our new Featherblade Beef Casserole serves as the perfect winter warmer, slowly cooked and marinated in Liberation Ale. Or perhaps fill up with a spiced vegetable, quinoa and five bean burrito, packed with protein and served with guacamole and sour cream. For the early risers, after catching the morning sun and perhaps a few good waves, the Surfer's Breakfast is a classic to refuel for the day ahead. Feast on a platter of duos with two rashers of bacon, two Cumberland sausages, two hash browns, two fried eggs and two slices of toast - not forgetting grilled tomato, black pudding and mushrooms! If noon has passed but breakfast is still on the mind, the Open Breakfast Ciabatta will satisfy with Cumberland sausage, crispy bacon, hash brown, baked beans and a fried egg. If you find yourself on the west of the island this winter, don't miss a trip to the Watersplash and enjoy the waves with the warmth of friends, family and great tasting food. To plan ahead, visit the Watersplash website to find out the latest opening hours and see what the swell is doing live on the Splash Cam.